"I need to what?" Janelle asked with disbelief in her voice. "You need to have his teeth checked every six months," I was talking about a newborn colt, a long-legged bay, we were examining back in 2003. He had been a surprise package when Janelle had purchased the mare the previous summer. "Sugar Shack is just a baby! Why do I need to do that?" I explained to Janelle that the little colt had brachygnathia, a parrot mouth—his upper jaw was longer than his lower. Brachygnathism may represent a genetic mismatching of two horses with very different facial structures. With Shack, we could only guess. Backward pressure from the overlapping incisors against the lower incisors will act to displace the lower teeth caudally (backwards). Over time, because of the poor alignment of his teeth, his first upper deciduous (baby tooth) cheek teeth on each side would develop hooks in front, protruding down where they overlap the bottom premolars. The hooks could also prevent his lower jaw from growing forward, and certainly would prevent the cheek teeth from meeting evenly. Periodically we would need to file off these overgrown hooks on his baby teeth to allow his lower jaw to slide forward and we will also tend to the abnormal growth pattern on the incisors—we don’t want the lower incisors to grow up into the roof of his mouth. The permanent teeth would develop the same problem when they came into wear. Severe forms of parrot mouth may be helped by orthodontic devices—wires and external head gear. But Shack would do just fine with a little help from his friends. Janelle just wanted to enjoy her new colt. When a newborn foal is examined for the very first time, the veterinarian will check the gums and jaw alignment, but by two weeks of age, the foal has 16 new baby teeth. By nine months of age a foal has 24 baby teeth—6 incisors on the top, 6 on the bottom, and 3 premolars on each side, top and bottom. By a year, he’s got his first permanent molars. The yearling’s soft deciduous teeth have been in wear long enough that the action of his chewing has created “points”—sharp edges. Commonly, these youngsters will have ulcers or abrasions on the inside of their cheeks where the sharp points have rubbed. Occasionally, lack of space in the jaw or softer or inadequate dentin inside the baby tooth will predispose one tooth, or more, to dental disease, displacement, or even fracture of the tooth. There are times, then, when early professional dental attention can influence a successful performance career or be the difference between quality of life and discomfort, for the horse. 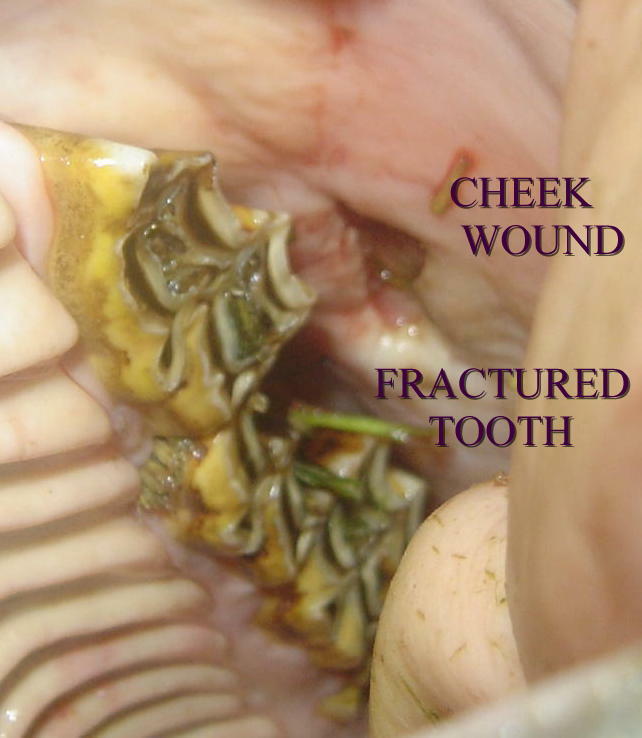 The following are case reports illustrating the significance of dental intervention in the life of the young horse. Frisco had been running with four other yearlings all summer on lush pasture and had just been trucked back to the home ranch for the winter. He looked a little rough, a little thin, but he seemed to be eating with gusto. About half way up the left side of his face, though, was a lemon sized lump. The lump was hard and when I touched it, Frisco moved away and opened his mouth just a bit. My husband and partner, Dr. Jim Latham, sedated Frisco at the ranch and took a look in his mouth. There was a laterally displaced cheek tooth, the third upper deciduous premolar and a large, deep, rectangular ulcer next to it in the cheek. 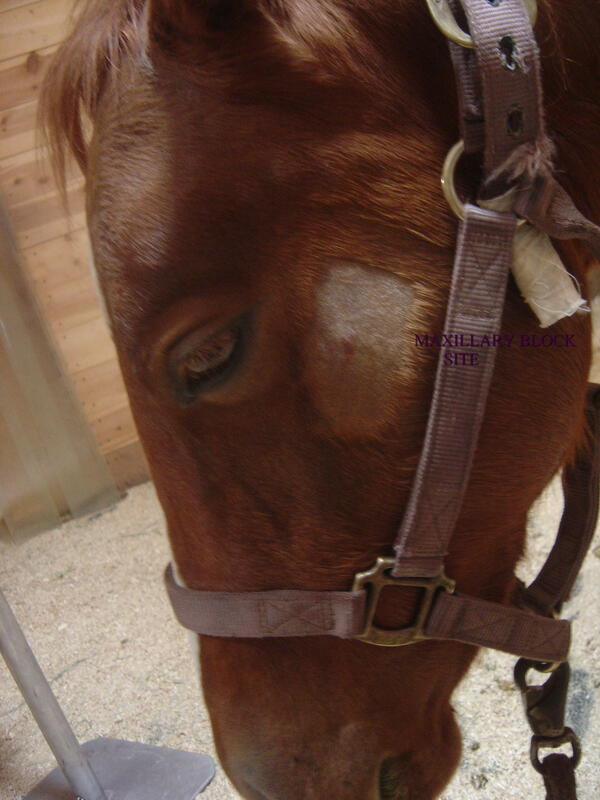 Frisco was packing feed between his cheek and the displaced tooth to reduce the pain. We arranged for Frisco to come up to our clinic so that we could start him on antibiotics and pain relievers and take some x-rays. The following day, Jim sedated Frisco once again. We worked together to take oblique x-rays of his left upper jaw. We could see a tooth fragment and the remaining tooth, the D207 by the Triadan numbering system, had lucent, less dense areas. The bone above looked reactive. Jim placed the full mouth speculum on the yearling and opened his jaws. With a light, we could see the tooth was fractured lengthwise and the lateral half had displaced into his cheek, one root of the fragment still intact sideways in his upper jaw. Jim performed a maxillary block using a four inch spinal needle. The placement was just under the zygomatic arch, under the left eye, and about two and 1/2 inches deep to reach the maxillary nerve. He injected 20 cc of lidocaine, a local anesthetic, to deaden the nerve. We deepened Frisco’s sedative and added butorphanol for additional pain relief. He already had IV Bute on board. Using molar and root extractors, Jim was able to remove the lateral fragment and the rest of the fractured tooth. He used an elevator to curette as much damaged tissue from the alveolar sockets as possible and we flushed the defect with diluted chlorhexidine. Post op x-rays showed the extraction site and evidence of the apparently intact tooth bud of the permanent 207 above the socket. This permanent tooth would not normally erupt for one more year. In the mean time, we planned to flush Frisco’s cheek twice a day until his ulcer healed and to keep him on antibiotics and Bute until the tooth socket began to fill in with clot and fibrous tissue. Frisco barely missed a meal, but eating is now a pleasure instead of a pain. Sugar Shack didn’t make his dental appointment until the age of 2 years, 6 months. His owner had just begun his groundwork. Although he looked shiny and fit, Shack’s parrot mouth was still evident. Jim sedated him to take a look inside. The colt had spike-like hooks protruding down from his first cheek teeth and behind the hooks, the premolars were slightly cupped out—worn from his abnormal bite. The colt had lost his first two lower premolar caps and was not yet ready to lose the upper two. Jim used hand carbide floats to reduce the hooks and float Shack’s points. We discussed with Janelle the need for frequent dental work to keep Shack’s bite as good as it would be, especially as his first permanent premolars came into wear. She agreed to let us remove Shack’s wolf teeth in the spring—before she used a bit. Painter is a well built chestnut and white gelding, three and a half years old. He moved to Colorado from Texas and found a home as a trail horse. His new owners allowed him time to adjust to the altitude and then began gentle work with the already green broke young horse, first with a snaffle and then with a hackamore. Every time Painter was asked to turn to the right, he stiffened, tossed his head, protesting the request. His sensitive owners called us to look at the horse. They wanted to know if he had a mouth problem or a stubborn attitude. Painter was in good shape. He wasn’t having any trouble eating. Jim sedated him and after flushing Painter’s mouth with a disinfecting rinse, Jim placed the full-mouth speculum, setting the mouth plates on the incisors, and gradually opened the ratchet. He placed Painter’s chin on the head stand and we both took a look in the horse’s mouth using head lamps. Painter had incredibly sharp points on his soft three-year old premolars and molars—on the outside of his maxillary arcade, the upper cheek teeth, and on the inside of his mandibular teeth, in his lower jaw. There were darkened ulcers and roughened calluses on the sides of Painter’s cheeks where the soft tissue had rubbed against the sharp points. Whenever his owners asked him to flex, the action of the bridle and bit or hackamore would push his cheeks against his teeth. But why the resentment to the right? Painter had felt the eruption of 24 permanent teeth in the last 18 months. His mouth had been busy. He had recently lost his right upper D108, the deciduous cap—a baby tooth remnant over a permanent erupting 108, the fourth premolar tooth. The opposing lower 4th premolar still had a cap, loose, moving, bleeding and rubbing with each motion of the jaw. The left side caps were gone. Jim used his hand floats to remove the sharp points on all arcades. 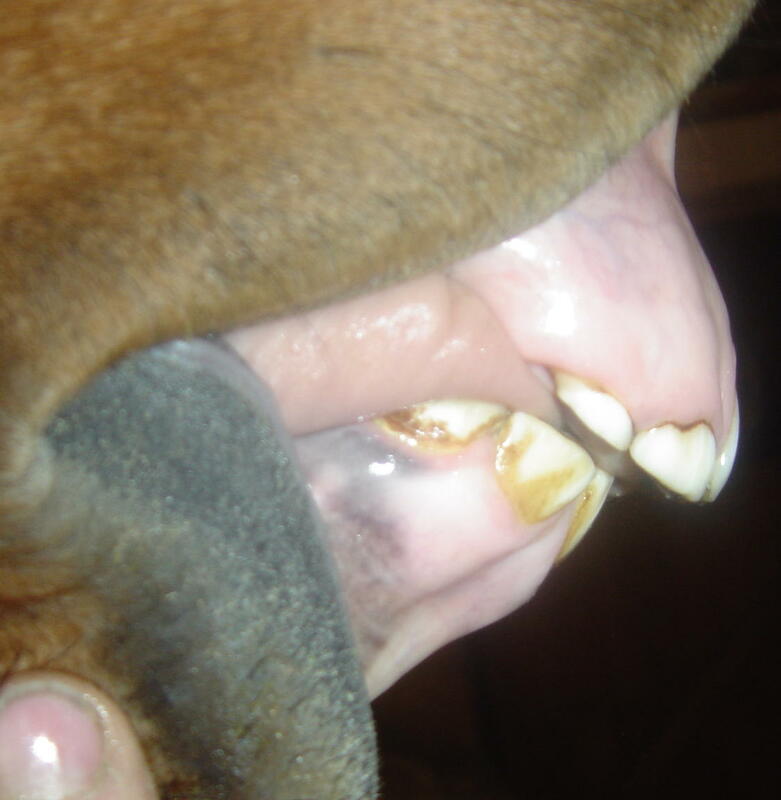 The softer teeth of young horses usually make this a quick job. He then used cap pullers to remove the loose deciduous tooth. The first premolars are the “wolf teeth”—small, pointed knobs that can interfere with bitting. Painter’s had already been removed or possibly he never had them. In this case, dentistry increased Painter’s quality of life at a critical time in his career, allowing him to respond to the gentle clues of the bit or hackamore rather than feeling pain from the bridle pushing his cheeks against his sharp points and his loose baby teeth. The entire relationship of Painter and his new owners changed with the removal of pain from the training process. They are all enjoying the trails. Frisco should fill in the gap in his jaw in a year’s time and all permanent teeth should be in wear by five to six years of age for Frisco and Painter. But Shack will require the dedicated attention—at least twice a year--of both owner and veterinarian to keep his mouth comfortable and preserve his teeth for life.